Yep, T7 is now free to all customers! Be sure to grab your free license today. Great for solo artists or your entire band. T7 offers many workflow improvements over older versions, so be sure to download and start exploring. This is no ‘Lite’ version, we do not impose track limits, plugin limitations or other such constraints commonly found in other low cost offerings. Why? – we think you will enjoy using the app so much, you will discover the value in investing in our latest versions and the expanded features we are voraciously adding. Innovation and creativity is what drives us – join the ride today and download T7 for Mac, Windows, or Linux operating systems. Like all Tracktion DAW applications, T7 features an intuitive, single-screen interface. Input, waveform and mixer – including EQ, level, pan and plugins – are laid out from left-to-right. Simply drag-and-drop additional features and automation on any track as needed. 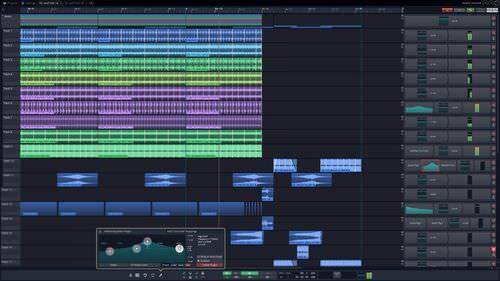 Unlimited numbers of audio and MIDI tracks, combined with a professional feature set, allow you to compose, record, edit, mix and share your music with ease.